Wherever Christina Smith goes, she births a new bundle of questions. While standing in line at a coffee shop, she wonders why people stand in lines. Why don’t they ever talk to the person in front of them? Why are we so obsessed with being productive? And why, when someone has a baby, is the first question we ask: Is it a boy or a girl? Why … why … why? Like a curious kid, always asking: Why? “I don’t think I ever grew out of that,” said Smith, a fourth-year sociology student at Laurier, during a recent interview. Asking more questions — and better questions — has been the bane and benefit of her studies in sociology. “It helps you question almost anything … which can be a little terrifying at first,” she said, laughing. A lot of first-year students want their professors to just fork over the right answer to any given question on social justice or equity in society, said Lucy Luccisano, chair of Laurier’s Department of Sociology. With a strong focus on social justice and equity, Laurier’s Sociology programs and faculty help students form questions and give students the tools to research and analyze social situations that surround us all. “We give the ability to move beyond the ‘common sense’ analysis of social life,” Luccisano said. For many years the department has offered statistics courses and has taught students to think critically and write clearly. A new, enhanced focus on social research methods and analysis is being planned for the near future. Pending university approval, an option would be available for students who wish to add a credential in 'applied research methods' to be written alongside their major on their degree. Students who choose to participate would get enhanced training in research methods including interviewing skills, conducting focus groups, and examining data by using statistical analysis. They would also get a better understanding of survey design, and how to analyze opinion polls and public policy. 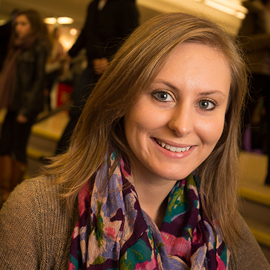 For Smith, who recently got an award for having the top GPA among fourth-year sociology students, learning solid research methods and applying them came early at Laurier. Assigned to write a paper in her first year, she conducted a content analysis of advertising in a magazine that’s marketed squarely at women. Smith sat down with a dozen different copies and documented the way women were portrayed in every single advertisement — noting, among other things, how often models were depicted in submissive, less-than-tasteful poses. The revelation confirmed for Smith that deciding to become a primary school teacher was the right career choice, and that studying sociology was the best way for her to get there.